First item on the agenda upon returning to Buenos Aires from Spain: getting Kurt fitted for a suit at "Sastreria Fabio," the tailor around the corner from our apartment. Fabio, a spry gentleman who looks at least a decade younger than his 70 years, learned how to create made-to-measure suits and handle other tailoring chores in his native Naples, Italy, where he apprenticed before immigrating to Argentina. Fabio explained that when he turned 13 his father gave him two options to roaming the streets with his friends: continuing his schooling or learning a trade. He apprenticed with a tailor for four years, earning knowledge and the occasional monetary tip from his mentor when his capabilities expanded. Lamentablemente, he says, he has had no luck recruiting his own apprentice to carry on the trade. 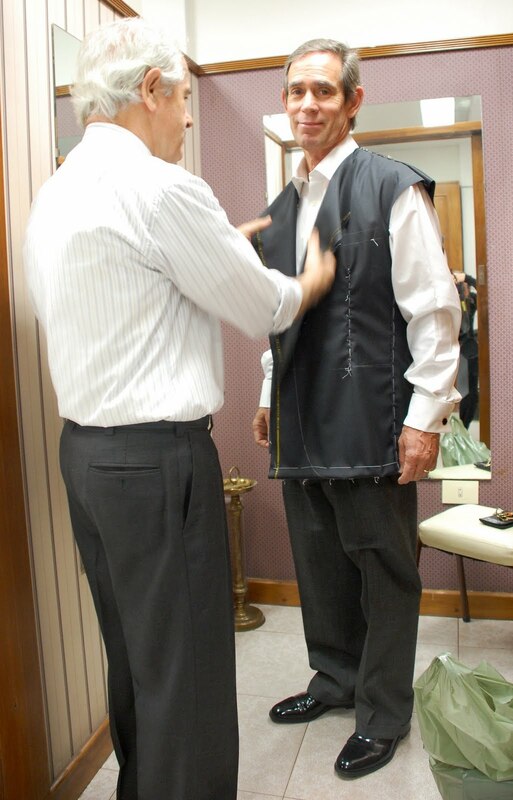 Kurt was measured for the suit on August 9. For the jacket, a two-button front, three functioning buttons on the sleeves, and two side vents. For the pants, two coin pockets and no cuffs. European style sensibilities prevailed; Fabio dismissed the American predilection for center vents, for example, on the grounds that they rumple too easily. The first fitting (above right) was August 24. Second fitting was September 1. We picked up the finished suit today (left). ¡Muy elegante! And just in time for the wedding of favorite son Joey to adorable Lauren on September 25.